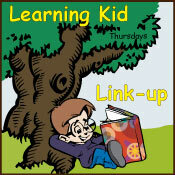 If you have children, you likely spent much of their early years talking to them and reading to them. Encouraging language development comes so naturally to the new mom. We repeat words, point out words and pictures, try to get our kids to repeat words, etc. I (and possibly many of you) even taught my kids some basic sign language so that they could communicate before they were able to verbalize their needs. We seem to know, without question, that the way to develop language and literacy is to talk and read with our kids. Talking math, on the other hand, does not seem as intuitive, and for some, may seem downright terrifying. 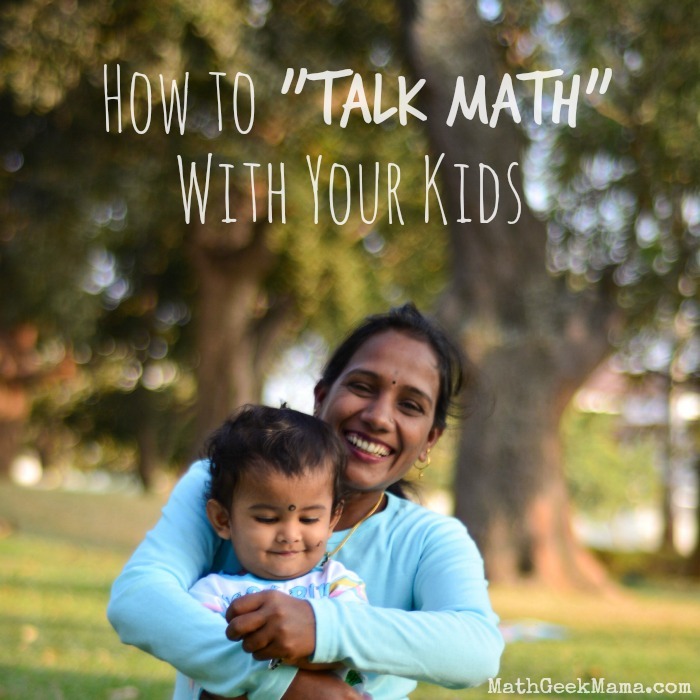 So how can you increase math talk with your kids? 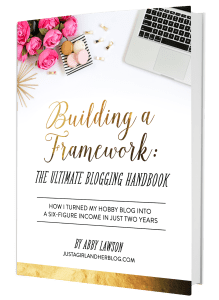 Here are some practical tips. First of all, you may be wondering why this is even an issue. After all, isn’t math about numbers and computations? Of course talking increases language skills, but why would talking help with math skills? While it is true that math is learned by doing, numerous studies have shown that early math talk is essential and has a large impact on future math success. It seems that early number related talk (including counting, comparing, sequencing, and discussing shapes) sparks an early interest in math and can decrease math anxiety. A recent study from the University of Chicago and published in the journal Science, followed a group of 587 first graders in the Chicago area. The goal of the study was to determine if increasing parents’ involvement in math at home would increase the child’s achievement at school. To test their theory, they gave some of the families the Bedtime Math app to use at home. This app (similar to the books) presents a story for parents and children to read together and then poses math problems related to the story. Other families used a similar app, which allowed them to read a story together, but did not involve math. At the end of the school year, they saw a marked improvement in the students who had been using the Bedtime math app. The most significant finding, however, is that the greatest gains were in those children whose parents claimed to be anxious about math. Parents who are anxious about math tend to have a negative impact on their child (and their feelings toward the subject). By the end of the year, after spending a little time with the Bedtime math app (even as little as once a week) these kids looked like the kids of parents who aren’t “math anxious.” This is significant given the findings in this study, which showed “math anxious” parents who helped their children with homework did more harm than good! While it’s not clear what exactly it was about this project that made the difference for students (the technology, the stories, the types of problems, etc. ), it seems that having opportunities to talk about math in a non-threatening environment (like while reading a bedtime story) increased students’ confidence and math abilities in the classroom. It may have also been good for the “math anxious” parents who felt ill equipped to teach or help their kids with math. While this study incorporated the Bedtime Math app as a form of intervention and a conversation starter, the study is not about the app itself. It is about the impact that even just a small amount of math related discussion can have on a child’s achievement. This app is interactive and involved both the parent and the child. 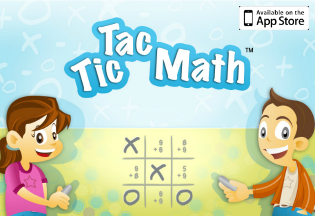 There are many, many math apps out there, most of which involve handing the iPad over to your child and letting them “do math” for a while. Bedtime Math is different: it involves the parent and child reading and discussing ideas and math problems together, and I think that is the key to the impact seen in this study. 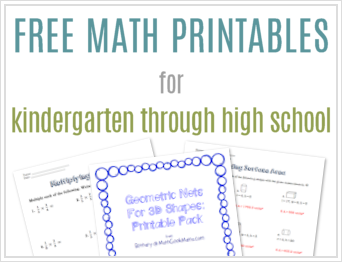 So if you would like to make math and number talks a more normal and natural part of your interactions with your kids, but aren’t interested in using the app or don’t have the necessary device, there are lots of other ways to do that! Point out numbers in everyday life-on speed limit signs, on clocks, house numbers, sale signs in the grocery store, etc. Count things throughout the day-number of pretzels for snack, number of books read, number of blocks in the tower (or the number of Skittles). Talk about the time-the time you eat breakfast, lunch or dinner, how many hours until daddy gets home, how long naptime is, etc. Use a calendar-discuss how many days are in the month, see the numbers in order, talk about ordinal numbers, count the number of days until a holiday or birthday, or how many days in a week. Observe shapes-look at the shapes around you, discuss what shapes things are made up of (kids are brilliant at this!) and compare shapes. At snack time-divide snacks and discuss how many each child gets (i.e. there are 8 apple slices and 4 kids, so how many do you each get? ), or discuss subtraction-how many do you have after you eat 1? 2? Count syllables-as you’re working on reading and language skills, count and clap the syllables in words or phrases. Discuss directional words-discuss things in relation to one another (behind, on top of, across, under, between, etc.). Ask “How many?”-this is probably the easiest habit to form-simply ask “How many?” often. “How many pieces of candy do you have?” “How many fish are in the picture?” “How many girls are in our family?” etc. 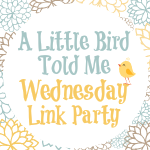 While these kinds of discussions may take some getting used to and may feel more “planned” at first, it will soon become more natural and an easy part of your interactions with your child. If you’re looking for more ideas, I highly recommend checking out Christopher Danielson’s site, where he writes about practical and fun ideas, as well as his eBook, Talking Math with Your Kids . In my case I almost have the opposite problem. 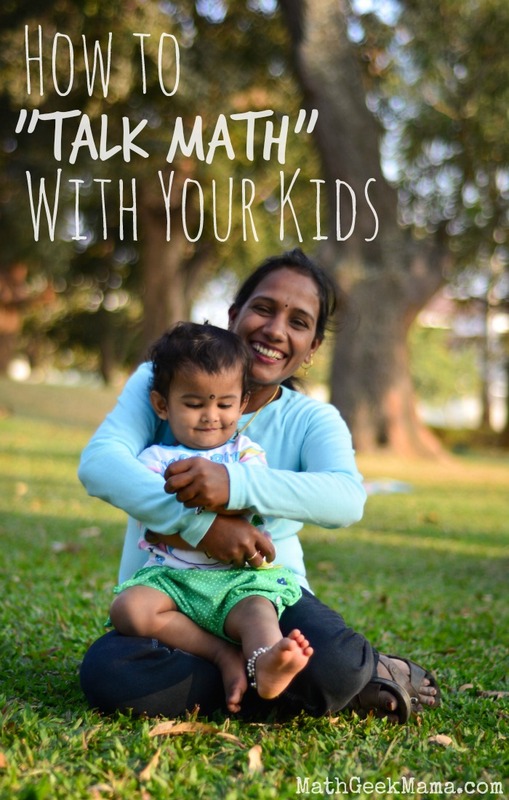 I talked math with my daughter from the beginning and it was just a part of our way of life. She’s 5 now, and is always relating things somehow to math in everyday conversation, even with people that aren’t me lol. Many times people mention it to me. For example, she will remember the girl who sat at seat #16, or the boy #12, she won’t learn their names for a bit, but she’ll know them by number. And instead of telling someone she has 13 dolls, she’ll say, there’s 3 groups of 3 or 9 dolls over there, and 4 dolls over there, which is the same as 10+3, so I have 13 dolls. I’m happy she realizes tho that math is not just a subject for school, it’s useful in our everyday life.